Join The Urban Politico team for tonight's Republican Presidential Debate. Airing tonight at 8pm ET/5pm PT is the Western Republican Presidential Debate live from Las Vegas, Nevada. The debate is sponsored by CNN and the Western Republican Leadership Conference. 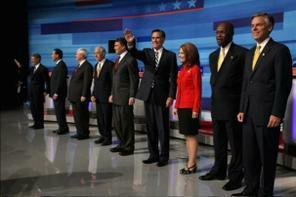 Tonight's broadcast will feature seven GOP candidates since Jon Huntsman has chosen not to attend this time around.